Erik Westermann has recently published Remote Astrophotography Using Slooh.com – A Handbook. Slooh.com is a remote telescope service that offers its members the use of eight telescopes in two hemispheres. The book is designed to appeal to those that are interested in astronomy at the beginner to intermediate level. For beginners, it’s for those who may have an interest in the things you see in the sky at night but might not have a lot of background information and you want a place to start and have a good foundation to build upon. Those at the intermediate level will also benefit as he demonstrates methods to improve skills in composing and processing images as well has how to gain skills in advanced subjects such as photometry. The book spans two broad parts: (1) Mission Planning and Booking and (2) Image Processing. There’s a third part to the book in the Appendix where he discusses how he uses Slooh, his adventures in exoplanet hunting and the tools and processes he used to write the book. 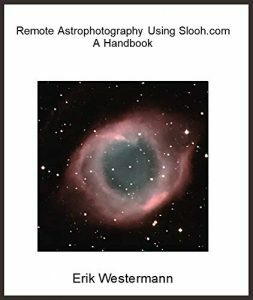 Remote Astrophotography Using Slooh.com – A Handbook is available from Amazon.